With Halloween a few short weeks away, it’s time to get decorating! There is something special about the spooky, seasonal decorations of the Halloween season. It’s so much fun to make things just a little bit creepy to get in the mood for the season. This adorable, but simple lollipop table decoration for Halloween is a fun and slightly creepy idea for a Halloween party or a unique way to set out goodies for your neighborhood trick-or-treaters. And if you use organic lollipops, you’ll know you’re giving out the best treats possible! Start by taping down any excess lollipop wrapper to make your pop as close to round as possible. If making for personal use, you can remove wrappers, but if for trick-or-treating, it’s best to keep the wrappers intact. Cut a square of tissue paper that is large enough to wrap around the lollipop, with a bit of excess trailing down. Wrap the tissue around the pop, gathering the excess at the base of the candy. Secure the tissue by sliding the ring onto the lollipop stick, overtop of the gathered tissue. You can use tape to ensure that the ring stays in place, if desired. 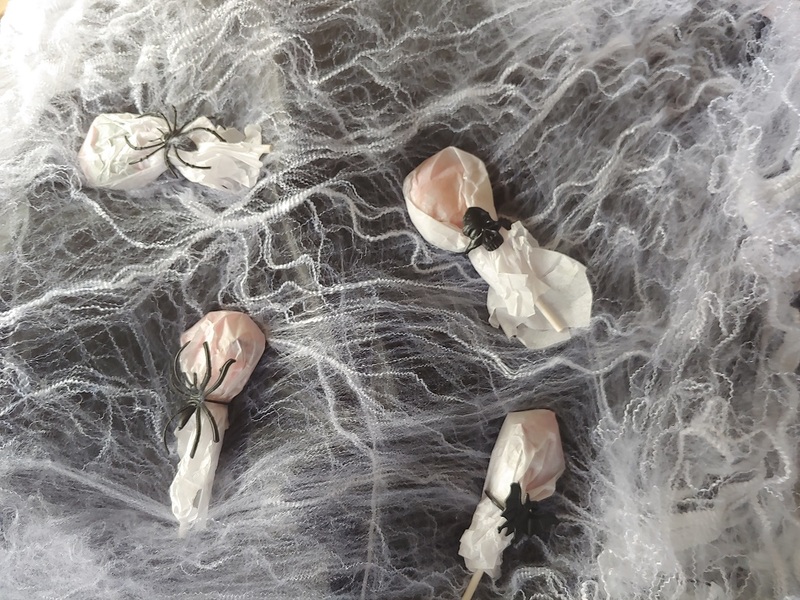 Spread the webbing over the tablecloth, then place your creepy spider and bat lollipops all over the “web”. 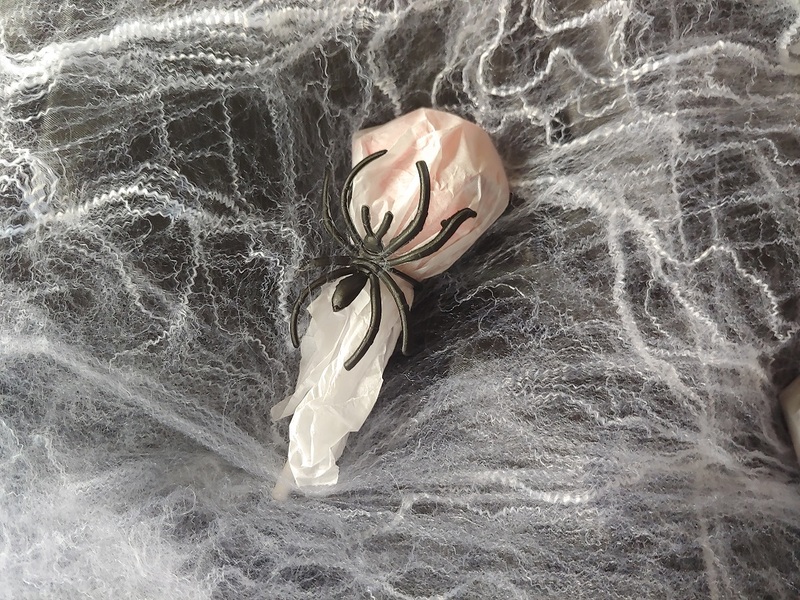 Let your guests or trick-or-treaters grab their treat right from the web! It’s a perfectly spooky table decoration for Halloween! 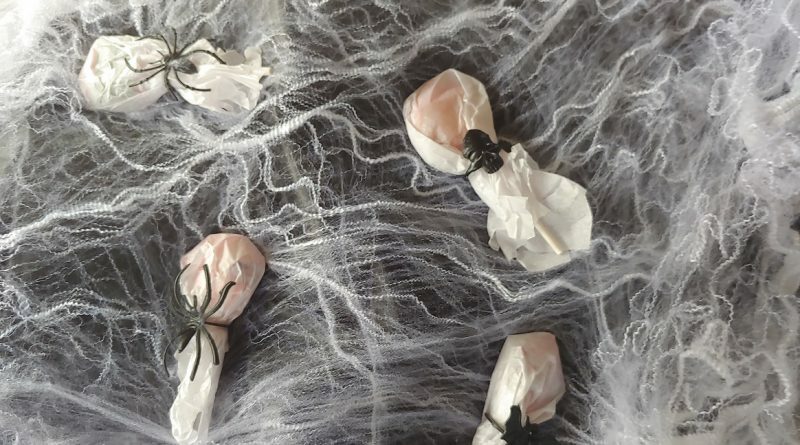 There is nothing creepy about the ingredients in the Koochikoo Organic Lollipops we used in our table decoration for Halloween! These are are the world’s first no-sugar, organic lollipops, which makes them a great treat to share with friends and family, as well as the trick-or-treaters that come knocking on the door for Halloween! Created by Grandma Sal, these delicious treats are a healthier alternative to the sugary snacks that are so often placed into trick-or-treaters’ bags. Koochikoo lollipops come in four amazing superfruit flavors that kids and adults both will love. Choose from blueberry lemon, Fiji apple, pineapple orange, and pomegranate blueberry, which are made with natural flavors and organic coloring. 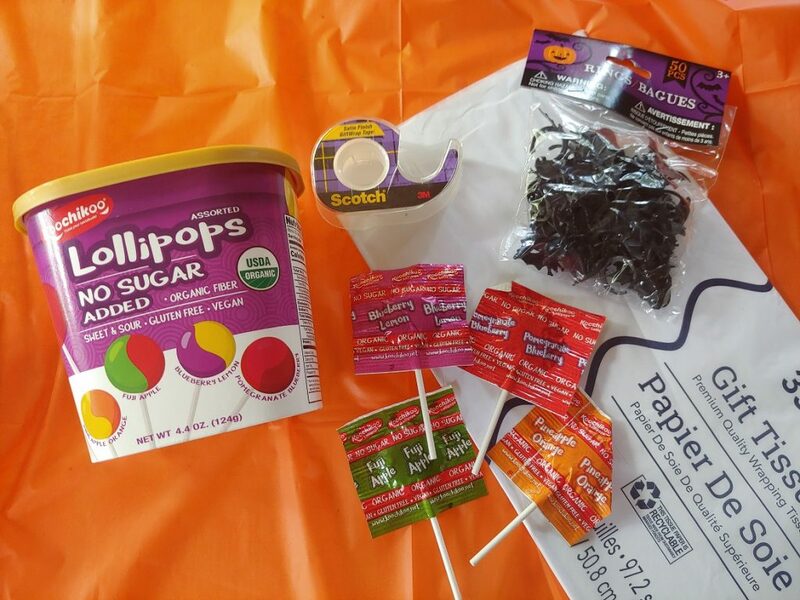 They sweeten the lollipops with organic tapioca fiber, making them completely free of processed sugar and artificial sweeteners. Plus, they are only 10 calories per pop! 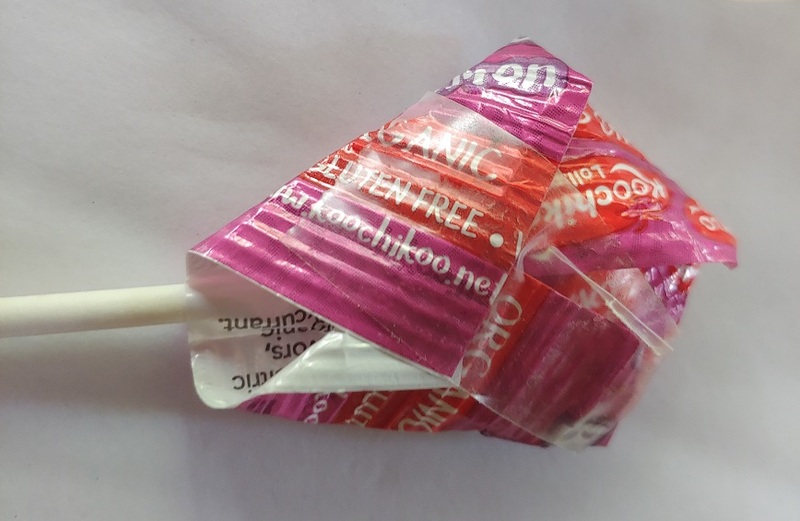 In addition to being certified organic, Koochikoo sugar-free lollipops are also gluten-free, vegan, and kosher. They are manufactured in a peanut-free, gluten-free, and dairy-free facility. This makes them a wonderful choice for just about any ghost, goblin, or fairy princess that might find their way to your door. 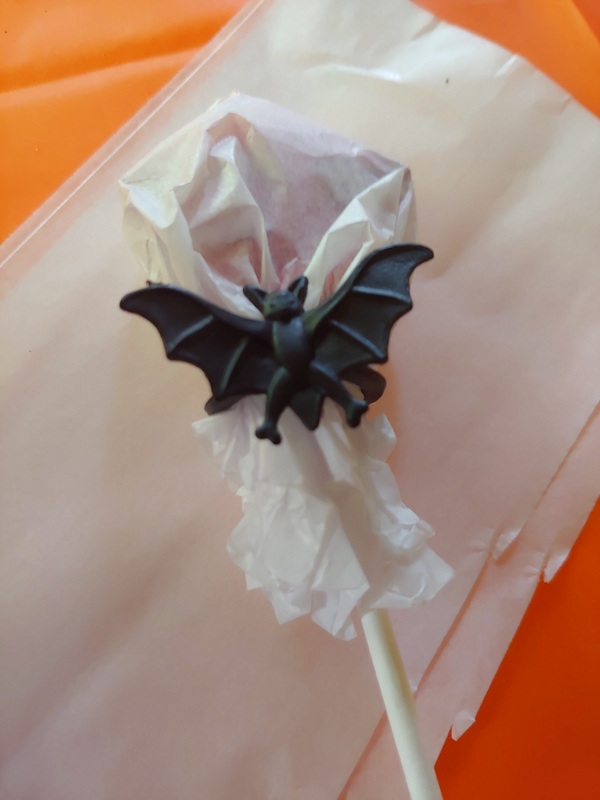 If you’d like to give Koochikoo lollipops a try or if you want to pick some up for trick-or-treaters and Halloween get-togethers, you can save 10% off your purchase with the code lollipower at the Koochikoo store on Amazon! How simple, yet adorable! I love the easy DIYs that go together quickly, and this looks like exactly what I’m looking for. The Halloween Lollipop tablescape is super cute! I am sure kids would have a lot of fun selecting a lolly from the table. Also, the flavors of the lollipops are right up this adult’s alley. I dont celebrate Halloween, but this candies is just adorable for kids. Now this is an awesome idea for table decorations, they look so creepy yet they are going to be a nice treat for anyone who grabs one as well. What a cute and fun idea! It really adds a lot to the party! That is so easy! This is some really great thinking! I am totally using this idea. I love Halloween and love these table decorations, they are adorable. Would love to try making these. Such a cute idea!! And my kids’ favorites are always lollipops! These are such a great idea for Halloween! I can’t wait to pick up a bag of them for the kids!! Ahh, so fun! I’d love to try this. All the Halloween ideas are so cool! Sugar free lollipops..damn. I didn’t even know such a concept existed and here you are making it a reality. Delightful, innovative and a yummy treat this Halloween!! This is such a super cute idea! 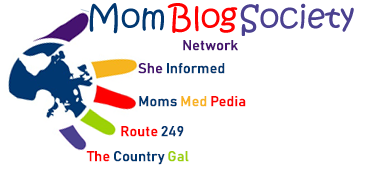 My kids will love doing this project with me!! We don’t celebrate Halloween, but I know my adult kids and their grandchildren do. This looks like a fun idea for decorating for the holiday. Very creative! Right! It’s simple but it does look spooky and goes well with the Halloween decor. You wouldn’t think that there’s a sweet treat inside!